For millennia, water for people is an inspiration. Even a little water will revive and refresh your garden. No matter what your garden is large or small, classic or running water will be welcomed at any site. A small waterfall will fill your garden a play of light and murmur of the jets. To create it easy, and delight you with it will for many, many years. Place falls far from the tree, this way you will protect it from falling leaves. Once in the water, the leaves can interfere with the normal operation of the pump. Trees with a strong root system the roots are able to raise and even to pierce the film, which is lined with the bottom of the reservoir. It is not necessary to make a waterfall close to home, since the constant noise of falling water can cause inconvenience. The creation of the channel waterfall. Waterfall taken at the same time create with a small pond. It serves as a reservoir for the water circulating in a closed loop waterfall. Dig a trench, get inside the protruding rocks and roots. Along the perimeter of the pond, remove the turf with a width of about 30 cm excavated soil to use to create slides. This is the basis for the future waterfall. Make the slope of the stair recesses. Don't get carried away with creating a multistage cascades. For maximum effect just one or two ledges that will fall in the water. Try to avoid sharp turns in the course of the water flow. Compact soil. The creation of the pipeline. Swipe a plastic pipe from the pit to the top of the hill. Mask it, but it must be accessible for maintenance. The cast of the film. Cover the entire area of the pit and waterfalland a nonwoven covering material. 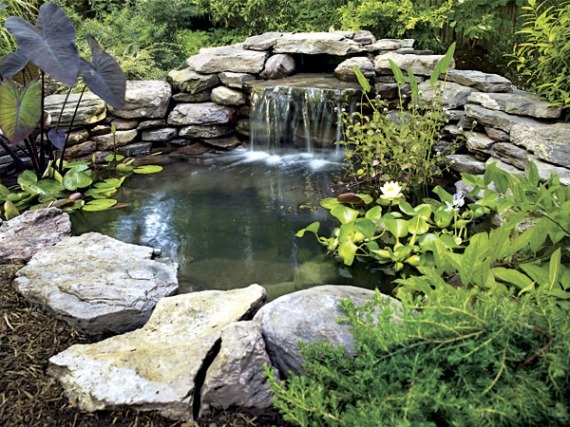 Create a pillow of sand layer not less than 2 cm of Sand should cover the bottom of the pond and the ledges of the waterfall. Stretch the film across the pond and the bed of the waterfall. Let the film to sink under its own weight. Build a waterfall on a warm day, then the film becomes soft and easily accepts any form. Check the level horizontal position of the edges of each ledge. In order to adjust the level of the edge of the pit, put the level on a long Board. Install the pump, connect it to the hose and fill the pit with water. Leave it for a while the water that the film is finished. Then turn on the pump and let the water run down the ledges. Make sure that the water flows, where necessary. If the water spills out of the channel, lift the foil and add the ground in the right place. Leave the water in the reservoir and in the crevices of the stairs for the night. In the morning check how you lay the tape, and cut away the excess along the river , the waterfalland along the perimeter of the pond. Lay the edge of the flat ledges of large stones. Long and narrow blocks use to fill the distance between the ledges of the waterfall. Pay special attention to the bumpers. On top of the hill throw a few stones in the pyramid, to mask the outlet pipe. Around the perimeter of the reservoir freely put the stones, pressing them and masking the edges of the film. Very large stones that cannot be used in the design of the waterfalland the waterfront, set on the slope of the hill. This will give the whole structure more natural. When you lay the stones in the correct order, and secure them in place with mortar. Fill in the gaps between the stones along the river fallsand fertile soil and plant the plants. Use for planting Alpine plants such as obrieta, burachok rock, thyme, Dianthus-deltoides. Low conifers, planted on the hill will strengthen the slopes and give the effect of a natural object. If you have the need to connect the strip of rubber butyl tape, use epoxy.